While appearing on MSNBC Monday, DNC boss Debbie Wasserman Schultz falsely claimed that “crooked” Hillary Clinton is the most admired woman “in the entire world.” This, despite a poll showing 67 percent say she is not honest and trustworthy. “Hillary Clinton is the most admired and respected woman in the entire world, and there’s a reason for that,” Wasserman Schultz said. “Because she has spent her life standing up for the values that we as Americans embrace and that are the reasons we make a choice in our president. She’ll continue to make sure that we can help people reach the middle class. She’ll focus on making sure that we can continue to strengthen our diplomatic alliances around the world. 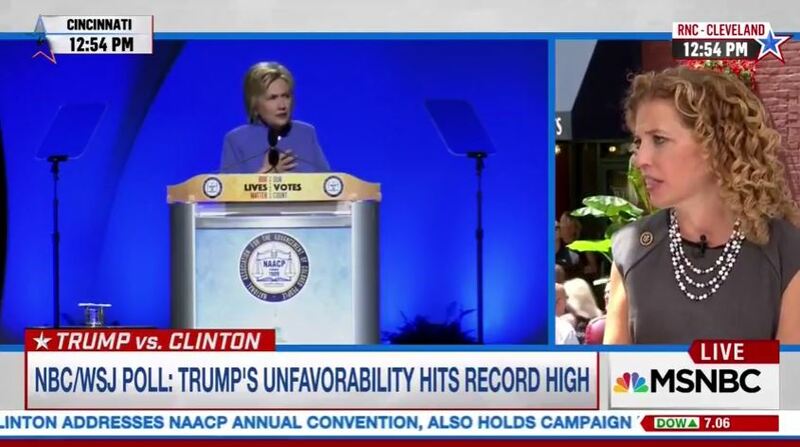 Clinton is hardly the most admired woman in her own country, with, besides Trump, the worst favorability ratings of a major party presidential candidate in history. If Schultz was citing the YouGov poll of the world’s most admired people in 2015, she was wrong. Clinton ranked third behind actress Angelina Jolie and human rights activist Malala Yousafzai.